In need of the best party supplies that will catch your guests’ attention? Then you need this Gleam N Curtain. Decorate your walls, door entrances or even ceilings. 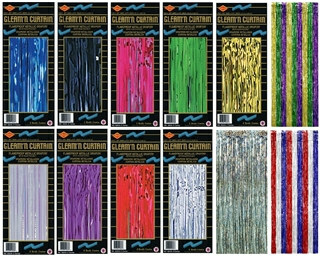 Because multiple colors are available of the 1-Ply Gleam N Curtain you can decorate for any type of theme from casino, raves, fiesta, sporting events, baby showers, and bridal showers or graduations parties. The possibilities are endless!